Has traditional marketing failed to help you realize your sales goals this past year? A new strategy for the new year could serve you well, helping increase your customer base and generate leads. Perhaps one of the most affordable ways to advertise is truck lettering for your Phoenix business. At Spotlight Signs and Imaging our vinyl lettering is the quality you demand at a price you won’t expect! With upwards of 70,000 views per vehicle, per day, just a few of your hard-won marketing dollars can generate an onslaught of new business just in time for the new year. Though the terms vehicle vinyl lettering and truck lettering may be used somewhat interchangeably, ultimately they both translate to one thing: results. The high-quality durable vinyl films are generated from top manufacturers like 3M and Avery, and fashioned into endless color combinations with our in-house graphic designers using the industry’s top software to generate custom specs. They are also quick to lend their expert eye to help our clients choose the best placement for maximum exposure. We’ll also help you install the finished product to ensure the placement is perfect the first time. While some companies offer additional discounts if you install yourself, often times, customers end up being out more than they bargained for. The slightest mistake can add up quick since there’s only one opportunity for a proper installation. We help you avoid a reordering fiasco while ensuring placement is perfect. The only thing outside of our repertoire are cookie-cutter vinyl lettering used by other decal companies. No matter your current branding strategy, our experts can match it and apply it to your entire vehicle fleet in a snap! Vinyl Lettering – Cheaper than an entire vehicle wrap while being equally effective, optimal placement of your company name, business slogan or motto, web site including social media channels, physical location, and/or bulleted list of services is the perfect way to spread news about your brand far and wide. Endless color and font options ensure your branding remains consistent while drumming up potential new business from every car you pass on the highway. However, even parked vehicles continue to relay your products or services to any passerby in its vicinity. 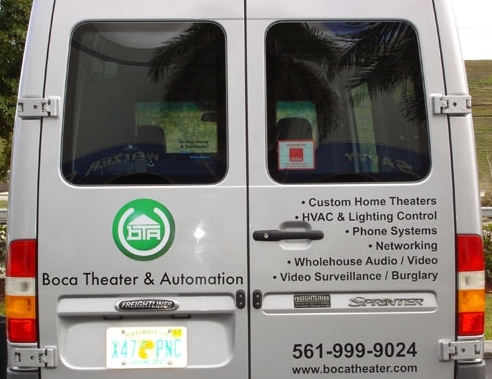 Vinyl Lettering and Graphics Combo – Want to use graphics to represent your brand? What about a corporate logo, QR Code or slew of social media icons? Our hi-res graphics are the perfect addition to any traditional lettering. Our designers will use their knowledge of visual space to plan the placements which are sure to complement one another. Why Spotlight Signs & Imaging? With decades of collective experience under our belts, we possess the knowledge to help you reel in leads, leaving you to do what you do best: serve your customers. Are you looking to buy vehicle vinyl lettering in Phoenix? Let us turn your company vehicles into moving billboards which work round-the-clock to help you advertise your business or brand. We can work up a free quote in no time and help you ring in sales as you ring in the new year!